The clicking whir and mechanical clanging is different at each pump-jack (think hobby horse) that works to pull oil up from the depths below this section of Price Canyon. The new-style linear rod pumps (which look exactly as their namesake describes them) are almost silent in comparison; a gentle gushing noise is all that gives them away. Paul DeLorenzo, the operations superintendent for Sentinel Peak Resource's Price Canyon property, says that belts in need of repair could explain clacking contrasts between the older wellheads. He would know. DeLorenzo has been working on this stretch of land between Pismo Beach and the Edna Valley since 1979. 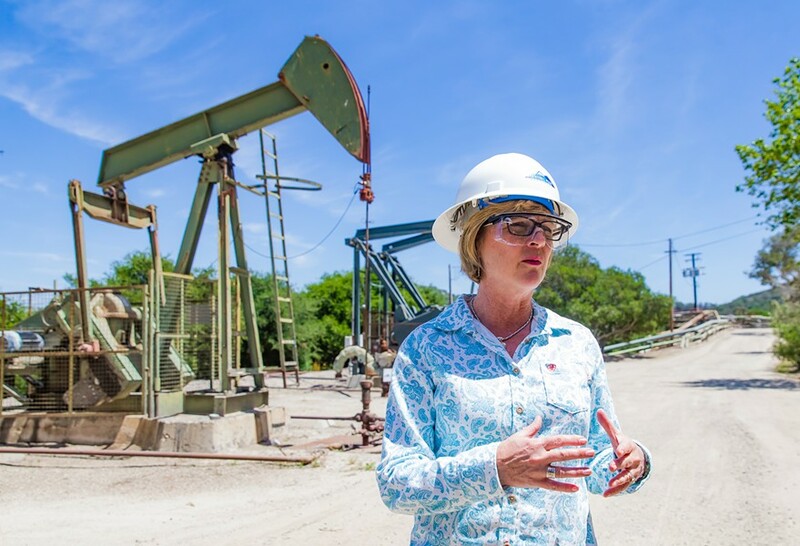 DEFENDING HYDROCARBONS Christine Halley, director of environmental safety and hazards for Sentinel Peak Resources, explains the process of oil extraction at the Price Canyon operation. DeLorenzo points out the window of the SUV he's driving. A black line cuts through the packed beige sand that makes up the side of a hill above the vehicle. It's a vein of petroleum. "This is our formation, so this is why we have to heat it up," DeLorenzo says. "It's oil sands." The heat DeLorenzo's referring to is steam. Water heated until it becomes a vapor is injected into the ground, flooding the sand formation hundreds of feet below the wheels of the SUV. That water seeps around particles of sand, liquefying the thick petroleum interspersed between granules. Eventually, the mix of liquid is pumped out of the ground. About 19 to 20 barrels of what's known as produced water comes up with every barrel of oil produced, according to Christine Halley, Sentinel's environmental health and safety director. She's sitting behind DeLorenzo. "We go about our business here using produced water," Halley says as DeLorenzo swings around a gigantic mass of tanks and tubes. "Clean it and then heat it up and inject it. ... What's unique here is the water reclamation facility." Produced water enters these tanks and pipes on one end, oil is separated, the water gets cleaned of impurities, and 560 acre-feet a year of that water gets added to Pismo Creek. Halley wouldn't get into the specifics about how exactly it happens, because it's a "coveted" process. Soft water is utilized in the steaming operation, and any produced water that's left over gets reinjected into the aquifer below. The whole operation—185 active oil wells, not all of which utilize steam injection—nets around 1,500 barrels a day of oil, which gets piped to the Phillips 66 refinery on the Nipomo Mesa and eventually becomes feedstock for jet fuel, gas, or diesel, among other things, Halley says. "It represents about 15 percent of what this county consumes on a daily basis," she adds. Currently, the field is in Phase 4 and awaiting county approval to complete the remainder of that 95-well project, which has 31 wells left to drill. The company is also waiting for an Environmental Protection Agency ruling that would exempt more of the Arroyo Grande oil field from the Safe Drinking Water Act, something it needs to continue operating some of the wastewater reinjection wells on the property—and, potentially, to drill more reinjection wells. Phase 5, which Halley says is on hold indefinitely, would drill 450 oil wells if it ever moves forward. Some of those would be cyclically steamed, and 100 of them would be replacement wells. "If that Phase 5 vision were to be played out, it's our estimates that this field would be producing 5,000 barrels [of oil] a day," Halley says. That potential increase in production is exactly what San Luis Obispo County residents like Charles Varni and Doug Timewell are worried about. 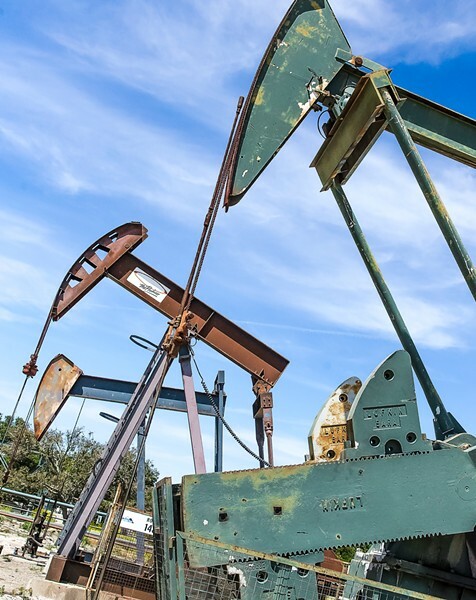 They are spearheading the Coalition to Protect SLO County's effort to get a ballot initiative passed in November that would ban hydraulic fracturing and drilling new oil wells. Coalition members are concerned about water contamination (due to oil and reinjection wells), the potential for increased earthquake activity, and other environmental disasters. Measure G, they argue, would enable Sentinel Peak to continue operating as it has consistently done over the last decade or so, producing between 360,000 and 700,000 barrels of oil per year. However, it wouldn't allow the oil company to increase its capacity. "They've been stable over the last several years," Timewell said. "What happens when they turn up the volume dramatically? There's no study that states that it's going to be stable." 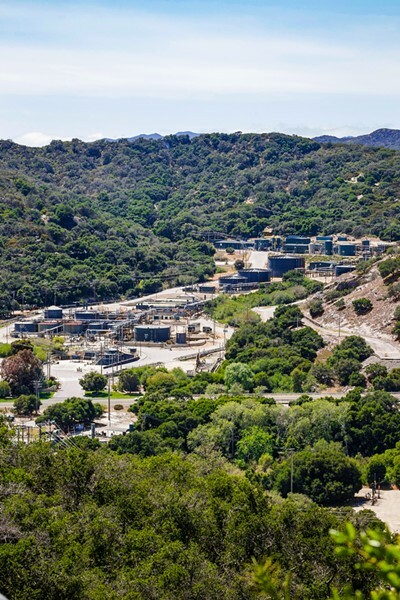 Sentinel Peak has said that if the measure passes, the oil company will eventually have to shut down its operations completely, laying off 20-plus employees and affecting more than 100 contract workers in the county. SLO County could become the seventh county in California to ban hydraulic fracturing. According to Kassie Siegel, director of the Center for Biological Diversity's Climate Law Institute, the six other counties are San Benito, Monterey, Mendocino, Butte, Santa Cruz, and Alameda. The common thread between all of the six, and including the one in San Luis Obispo, is a ban on fracking," Siegel said. "There's no better time to ban the practice of fracking than before it even starts." She said the center has been supportive of all the local measures to ban fracking and restrict oil and gas drilling, including Santa Barbara County's failed 2014 effort. Measure G is similar to Monterey County's Measure Z, which passed in 2016 and is currently winding its way through the court system after oil companies and royalty owners sued the county. Measure Z prohibits "the use of any land within the county's unincorporated area" for new oil and gas wells and well stimulation treatments, such as hydraulic fracturing and acid well stimulation treatments. It changed the county's land-use codes, similar to what Measure G is proposing. But Monterey County's measure also prohibits and phases out land uses that support oil and gas wastewater disposal—reinjection wells or ponds. A ruling issued by Monterey County Superior Court Judge Thomas Wills in December 2017 said that the petitioners didn't have standing to sue over the well stimulation treatments, citing the fact that these sorts of oil extraction techniques weren't currently practiced in the county. However, Wills also ruled that federal and state law pre-empted the local land-use changes that the measure implemented. He said the authority to regulate drilling oil, gas, and wastewater reinjection wells already rests with state agencies, the Department of Oil, Gas, and Geothermal Resources and the State Water Quality Control Board; federal law, the Safe Drinking Water Act; and a federal agency, the Environmental Protection Agency. Essentially: The fracking ban part of Measure Z stands, but nothing else does. "We disagree with that," Siegel said. "If you're getting into the weeds of this, oil companies will argue that anything below ground is preempted by state regulation, and we think that's clearly not true. ... We believe that Measure Z is lawful in every respect, and that's why we appealed." Center for Biological Diversity attorneys appealed the ruling on behalf of Protect Monterey County, the local group behind the measure. But the county itself made a deal with the oil companies on the lawsuit, agreeing to bow out of the appeal proceedings if the oil companies "declined to pursue attorney's fees and other costs, including for potential future challenges to the fracking ban," the Monterey Herald reported. TECHNOLOGICAL ADVANCE Linear rod pumps like these are dispersed among old style pump-jacks on the Arroyo Grande oil field. Siegel pointed to Beverly Oil Co. v. City of Los Angeles as one ruling that proves Measure Z is lawful. The 1953 U.S. Supreme Court case centers on a 1946 zoning ordinance enacted in Los Angeles that banned the drilling of new oil and gas wells and forbade the deepening of existing wells. Beverly Oil sued, arguing that the city intended to terminate its "nonconforming use" right to use the property for oil and gas production. The court ruled against Beverly. "We are dealing with one of the most essential powers of government, one that is the least limitable. It may, indeed, seem harsh in its exercise, usually is on some individual, but the imperative necessity for its existence precludes any limitation upon it," the majority opinion states. "There must be progress, and if in its march private interests are in the way, they must yield to the good of the community." The ruling, Siegel said, is just one of many that proves local jurisdictions have the power to generate ordinances that affect activities underground, such as oil drilling. Wills disagreed in his ruling on Measure Z, stating that the Supreme Court decision does not answer the question about conflicts between local and state authority. Siegel also contends that a century of court rulings in California affirm that local jurisdictions have a lot of power to protect themselves from activities they believe would be harmful to the public/residents. "Measure Z is fully lawful, but regardless of the final decision at the end of litigation when all the appeals are exhausted," Siegel said. "Measure G is different. It's not really relevant to what happens with Measure Z." Measure G, according to Siegel, builds off regulations and definitions that already exist in SLO County code. It doesn't seek to regulate wastewater injection or production techniques other than fracking. But, similar to Measure Z, it would ban land uses associated with drilling new oil and gas wells by amending the county's zoning code. SMALL FOOTPRINT Sentinel Peak Resource's oil operations are developed on 14 percent of the 1,400-acre parcel the company owns in Price Canyon. "All of these local oil measure, they respond to the local wants and the local needs," Siegel said. "Measure G doesn't regulate below ground, it regulates what goes on above land through zoning." San Benito County, for example, banned oil and gas drilling in residential areas of the county. The Santa Barbara County measure that failed sought to ban enhanced oil extraction techniques, including fracking, acid treatment, and steam injection. Monterey County, as the fourth largest producer of oil in the state, didn't have any oil and gas regulations on the county books before Measure Z passed. That lack of oversight was a major reason for introducing the measure, according to Mary Hsia-Coron with Protect Monterey County. She said that for decades Monterey County issued open-ended permits to oil and gas operators. "The holder of the permit has a blanket permit," Hsia-Coron said. "It basically says you can drill as many wells as you want." A fiscal impact statement on Measure Z by the Monterey County Auditor stated that in 2015-16, the oil industry paid a little less than $8 million in property taxes. In 2014-15, the industry paid a little more than $8.5 million. "Because the prevailing price of oil is an important factor in calculating property taxes paid by the oil industry, collections fluctuate accordingly. Assessments are conducted annually," the statement said. Monterey's impact statement also estimated that as many as 730 jobs were related to the oil services industry and related consumer spending. 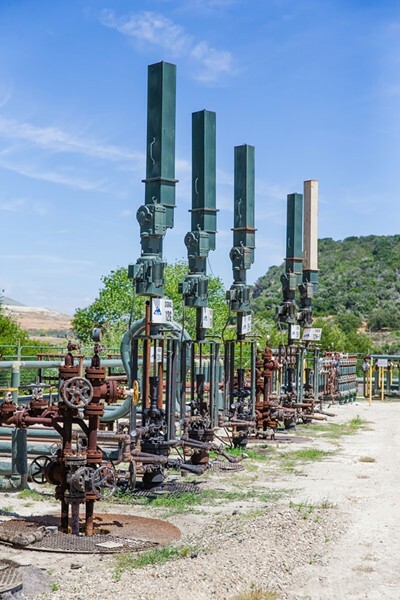 The SLO County Auditor's Office provided New Times with the amount of taxes collected from the companies operating the two oil fields in SLO County—currently, Sentinel Peak Resources in Price Canyon and E&B Natural Resources near Carrizo Plain National Monument. In 2016-17, taxes totaled $558,506, according to those numbers. It was about the same in 2015-16. According to a flyer from the campaign against Measure G, Stop the Oil & Gas Shutdown in San Luis Obispo County, the oil and gas industry provides more than $1 million to the county's general fund, and more than "230 mainly blue-collar workers and their families" are threatened with job loss should G pass in November. The flyer also says that the county stands to "lose an industry that is responsible for $64 million in economic output." "We have no intent of shutting down the current oil operation; we want it to continue," Timewell with the Coalition to Protect SLO County said. He argues that intensifying operations over the Arroyo Grande oil field (Phase 5) would shut down the operation faster than simply allowing it to continue operating as it has been. A Department of Oil, Gas, and Geothermal Resources presentation made as part of the 2015 application to exempt the Arroyo Grande oil field from the Safe Drinking Water Act states that the field has about 25-plus years of reserves left. "It's hard for people to wrap their heads around: The swimming pool is only filled with so much oil. It's not an endless reserve of oil," Timewell said. "If you've got 25 years of reserves and you're going to extract it at eight times the current rate, how many years to you have left?" Halley with Sentinel Peak declines to mention specifics about how quickly oil reserves would be depleted should the company intensify its operations. "With ongoing love, it could be ongoing," she says as the Sentinel Peak SUV pulls up next to a pad of linear rod pumps. FIGHT FOR TOMORROW Volunteers with the Coalition to Protect SLO County gathered more than 20,000 signatures to qualify Measure G, a ban on fracking and new oil wells, for the November ballot. She adds that the field has managed to continuously produce oil for 112 years, and that has to do with good maintenance, technology, shutting down wells that no longer produce, and drilling new ones. "If you were to look at oil production in Arroyo Grande 40 years ago, you would have thought we'd be done," she says. The presentation from 2015 notes that the first oil well in Price Canyon was completed in 1906 and approximately 560 wells have been drilled since then, producing 19 million barrels of oil. The operation started steam flooding in 1980. With oil production at around 1,350 barrels per day at the time of the 2015 application, the field produced almost 30,000 barrels of water per day and reinjected about 12,000 barrels of wastewater. Oil wells do stop producing over time, Halley says. Redrilling those wells or shutting them down and drilling new ones is part of how oil companies operate. Stopping Sentinel Peak's ability to do that, in essence, will prevent the company from maintaining its existing operations, she argues. And for someone like DeLorenzo, who's spent decades working at the AG Oil Field—even as it's changed hands over and over again—that's unacceptable. DeLorenzo says he's been through quite a few different operators, the most recent of which is Sentinel Peak. Freeport McMoRan sold Price Canyon and its other California oil holdings to Sentinel Peak in 2016 for $592 million. "It's important that we carefully consider before we eliminate jobs," DeLorenzo said at a June 19 Board of Supervisors meeting, adding that his 39 years of work in Price Canyon has provided for three generations of his family. Price Canyon isn't the only oil producing area of the county. In 2016, Russell Ranch oil field on the Carrizo Plain National Monument produced less than 50,000 barrels of oil, according to a June 2017 report from the California Air Resources Board. E&B Natural Resources, which operates the field, recently got approval from the Bureau of Land Management to drill a new well. The San Ardo oil field, Monterey County's main oil producer, produced almost 8 million barrels of oil in 2016, according to that report. Arroyo Grande oil field, which is SLO County's largest producer, produced 572,000 barrels of oil in 2016. In 2016, the same report shows Arroyo Grande had the second most carbon intense oil while San Ardo had the sixth out of 154 fields in the state. Carbon intensity is calculated based on production and transport of the crude oil supplied as petroleum feedstock. Measure G, proponents argue, would keep that "dirty oil" in the ground. "It's just dirty stuff, with a huge, probably the biggest—I'm not saying Arroyo Grande in particular, but operations like Arroyo Grande—have the dirtiest footprint in the world," Timewell said. HYDROCARBON LIFELINE Pump-jacks pull oil and water out of the Arroyo Grande oil field in Price Canyon. Sentinel Peak Resources, the field's operator, says an initiative on the November ballot threatens its future there. 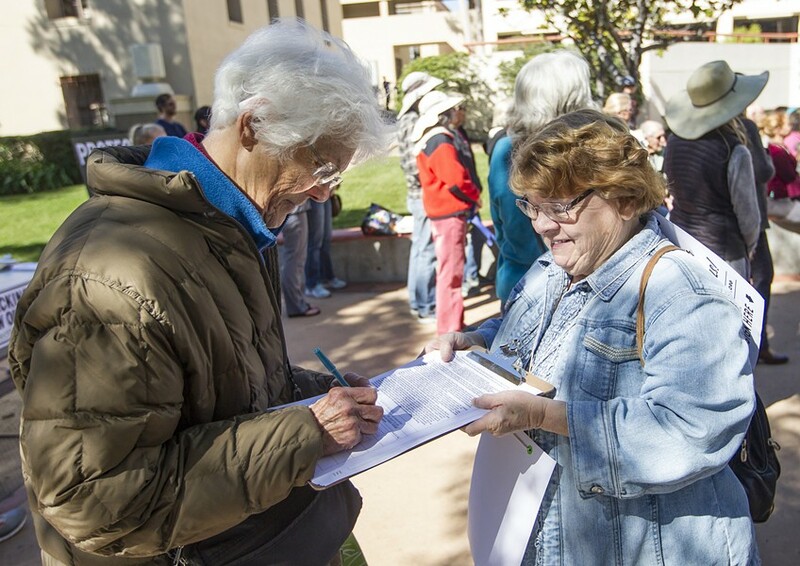 Coalition to Protect SLO County leaders like Varni and Timewell have a goal of raising a dollar for every signature collected on the initiative, or $20,473. Varni said they're in their first big fundraising challenge. According to a major donor campaign finance filing for the period between Jan. 1 and June 30, 2018, Sentinel Peak Resources has donated $500,000 to the Stop the Oil and Gas Shutdown, A Coalition of Concerned San Luis Obispo Taxpayers and Energy Companies committee. "We're still grassroots, and the whole public outreach part of the campaign is still the root," Varni said. "We know there's no way to compete, but how can we utilize resources—a fundamental one being people." Varni said they are working on outreach and education, including attending City Council meetings to plead their case for supporting the measure. Groundwater is ultimately the crux of what proponents are fighting to save.